Jet Black ABS brakes, Alcantara Leather Seat Trim, Compass, Electronic Stability Control, Front dual zone A/C, Heated door mirrors, Illuminated entry, Low tire pressure warning, Navigation System, Remote keyless entry, Traction control. - Welcome to Hi Tech Luxury Imports, Austin's premier dealer of Aston Martin, Bentley, Lotus, Maserati and Rolls-Royce vehicles.We offer the most extensive inventory of exotic, performance vehicles in Central Texas. Save time and call our VIP Ecommerce team at 512-401-2663. While every reasonable effort is made to ensure the accuracy of this information, we are not responsible for any errors or omissions contained on these pages due to errors with our third party inventory polling service. Please verify any information in question with Hi Tech Luxury Imports. Lunar ABS brakes, Alcantara Leather Seat Trim, Compass, Electronic Stability Control, Front dual zone A/C, Heated door mirrors, Illuminated entry, Low tire pressure warning, Navigation System, Remote keyless entry, Traction control. - Welcome to Hi Tech Luxury Imports, Austin's premier dealer of Aston Martin, Bentley, Lotus, Maserati and Rolls-Royce vehicles.We offer the most extensive inventory of exotic, performance vehicles in Central Texas. Save time and call our VIP Ecommerce team at 512-401-2663. While every reasonable effort is made to ensure the accuracy of this information, we are not responsible for any errors or omissions contained on these pages due to errors with our third party inventory polling service. Please verify any information in question with Hi Tech Luxury Imports. Magnetic Silver - Welcome to Hi Tech Luxury Imports, Austin's premier dealer of Aston Martin, Bentley, Lotus, Maserati and Rolls-Royce vehicles.We offer the most extensive inventory of exotic, performance vehicles in Central Texas. Save time and call our VIP Ecommerce team at 512-401-2663. While every reasonable effort is made to ensure the accuracy of this information, we are not responsible for any errors or omissions contained on these pages due to errors with our third party inventory polling service. Please verify any information in question with Hi Tech Luxury Imports. Jet Black - Welcome to Hi Tech Luxury Imports, Austin's premier dealer of Aston Martin, Bentley, Lotus, Maserati and Rolls-Royce vehicles.We offer the most extensive inventory of exotic, performance vehicles in Central Texas. Save time and call our VIP Ecommerce team at 512-401-2663. While every reasonable effort is made to ensure the accuracy of this information, we are not responsible for any errors or omissions contained on these pages due to errors with our third party inventory polling service. Please verify any information in question with Hi Tech Luxury Imports. Sky - Welcome to Hi Tech Luxury Imports, Austin's premier dealer of Aston Martin, Bentley, Lotus, Maserati and Rolls-Royce vehicles.We offer the most extensive inventory of exotic, performance vehicles in Central Texas. Save time and call our VIP Ecommerce team at 512-401-2663. While every reasonable effort is made to ensure the accuracy of this information, we are not responsible for any errors or omissions contained on these pages due to errors with our third party inventory polling service. Please verify any information in question with Hi Tech Luxury Imports. Red - Welcome to Hi Tech Luxury Imports, Austin's premier dealer of Aston Martin, Bentley, Lotus, Maserati and Rolls-Royce vehicles.We offer the most extensive inventory of exotic, performance vehicles in Central Texas. Save time and call our VIP Ecommerce team at 512-401-2663. While every reasonable effort is made to ensure the accuracy of this information, we are not responsible for any errors or omissions contained on these pages due to errors with our third party inventory polling service. Please verify any information in question with Hi Tech Luxury Imports. Onyx Black - Welcome to Hi Tech Luxury Imports, Austin's premier dealer of Aston Martin, Bentley, Lotus, Maserati and Rolls-Royce vehicles.We offer the most extensive inventory of exotic, performance vehicles in Central Texas. Save time and call our VIP Ecommerce team at 512-401-2663. While every reasonable effort is made to ensure the accuracy of this information, we are not responsible for any errors or omissions contained on these pages due to errors with our third party inventory polling service. Please verify any information in question with Hi Tech Luxury Imports. White Stone - Welcome to Hi Tech Luxury Imports, Austin's premier dealer of Aston Martin, Bentley, Lotus, Maserati and Rolls-Royce vehicles.We offer the most extensive inventory of exotic, performance vehicles in Central Texas. Save time and call our VIP Ecommerce team at 512-401-2663. While every reasonable effort is made to ensure the accuracy of this information, we are not responsible for any errors or omissions contained on these pages due to errors with our third party inventory polling service. Please verify any information in question with Hi Tech Luxury Imports. White ABS brakes, Electronic Stability Control, Front dual zone A/C, Heated door mirrors, Heated Front Bucket Seats, Heated front seats, Illuminated entry, Low tire pressure warning, Navigation System, Remote keyless entry, Traction control. - Welcome to Hi Tech Luxury Imports, Austin's premier dealer of Aston Martin, Bentley, Lotus, Maserati and Rolls-Royce vehicles.We offer the most extensive inventory of exotic, performance vehicles in Central Texas. Save time and call our VIP Ecommerce team at 512-401-2663. While every reasonable effort is made to ensure the accuracy of this information, we are not responsible for any errors or omissions contained on these pages due to errors with our third party inventory polling service. Please verify any information in question with Hi Tech Luxury Imports. Silver ABS brakes, Electronic Stability Control, Front dual zone A/C, Heated door mirrors, Heated Front Bucket Seats, Heated front seats, Illuminated entry, Low tire pressure warning, Navigation System, Remote keyless entry, Traction control. 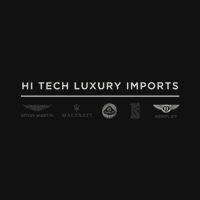 - Welcome to Hi Tech Luxury Imports, Austin's premier dealer of Aston Martin, Bentley, Lotus, Maserati and Rolls-Royce vehicles.We offer the most extensive inventory of exotic, performance vehicles in Central Texas. Save time and call our VIP Ecommerce team at 512-401-2663. While every reasonable effort is made to ensure the accuracy of this information, we are not responsible for any errors or omissions contained on these pages due to errors with our third party inventory polling service. Please verify any information in question with Hi Tech Luxury Imports. Lunar ABS brakes, Electronic Stability Control, Front dual zone A/C, Heated door mirrors, Heated Front Bucket Seats, Heated front seats, Illuminated entry, Low tire pressure warning, Navigation System, Remote keyless entry, Traction control. - Welcome to Hi Tech Luxury Imports, Austin's premier dealer of Aston Martin, Bentley, Lotus, Maserati and Rolls-Royce vehicles.We offer the most extensive inventory of exotic, performance vehicles in Central Texas. Save time and call our VIP Ecommerce team at 512-401-2663. While every reasonable effort is made to ensure the accuracy of this information, we are not responsible for any errors or omissions contained on these pages due to errors with our third party inventory polling service. Please verify any information in question with Hi Tech Luxury Imports. Frost ABS brakes, Electronic Stability Control, Front dual zone A/C, Heated door mirrors, Heated Front Bucket Seats, Heated front seats, Illuminated entry, Low tire pressure warning, Navigation System, Remote keyless entry, Traction control. - Welcome to Hi Tech Luxury Imports, Austin's premier dealer of Aston Martin, Bentley, Lotus, Maserati and Rolls-Royce vehicles.We offer the most extensive inventory of exotic, performance vehicles in Central Texas. Save time and call our VIP Ecommerce team at 512-401-2663. While every reasonable effort is made to ensure the accuracy of this information, we are not responsible for any errors or omissions contained on these pages due to errors with our third party inventory polling service. Please verify any information in question with Hi Tech Luxury Imports. Tungsten Silver - Welcome to Hi Tech Luxury Imports, Austin's premier dealer of Aston Martin, Bentley, Lotus, Maserati and Rolls-Royce vehicles.We offer the most extensive inventory of exotic, performance vehicles in Central Texas. Save time and call our VIP Ecommerce team at 512-401-2663. While every reasonable effort is made to ensure the accuracy of this information, we are not responsible for any errors or omissions contained on these pages due to errors with our third party inventory polling service. Please verify any information in question with Hi Tech Luxury Imports. Light Silver - Welcome to Hi Tech Luxury Imports, Austin's premier dealer of Aston Martin, Bentley, Lotus, Maserati and Rolls-Royce vehicles.We offer the most extensive inventory of exotic, performance vehicles in Central Texas. Save time and call our VIP Ecommerce team at 512-401-2663. While every reasonable effort is made to ensure the accuracy of this information, we are not responsible for any errors or omissions contained on these pages due to errors with our third party inventory polling service. Please verify any information in question with Hi Tech Luxury Imports. Grey - Welcome to Hi Tech Luxury Imports, Austin's premier dealer of Aston Martin, Bentley, Lotus, Maserati and Rolls-Royce vehicles.We offer the most extensive inventory of exotic, performance vehicles in Central Texas. Save time and call our VIP Ecommerce team at 512-401-2663. While every reasonable effort is made to ensure the accuracy of this information, we are not responsible for any errors or omissions contained on these pages due to errors with our third party inventory polling service. Please verify any information in question with Hi Tech Luxury Imports. White - Welcome to Hi Tech Luxury Imports, Austin's premier dealer of Aston Martin, Bentley, Lotus, Maserati and Rolls-Royce vehicles.We offer the most extensive inventory of exotic, performance vehicles in Central Texas. Save time and call our VIP Ecommerce team at 512-401-2663. While every reasonable effort is made to ensure the accuracy of this information, we are not responsible for any errors or omissions contained on these pages due to errors with our third party inventory polling service. Please verify any information in question with Hi Tech Luxury Imports.